Felicia Mabuza-Suttle is a columnist, a former lecturer and author. She published her bestselling autobiography, Dare to Dream, in 2002. It is about the story of a girl from the dusty streets of Soweto who dared to dream and made her dream a reality, leaving her homeland of South Africa in search of the American dream. Her second book, Live Your Dream, is a sequel to her first book on how she made her dream a reality and encourages young people to ensure that no one and nothing should stop them from accomplishing their dream. Both Felicia Mabuza-Suttle's books are a true illustration of passion, determination and persistence, when she responded to former President Nelson Mandela's call in 1991 to all South Africans living abroad to come back home to help rebuild the new South Africa. 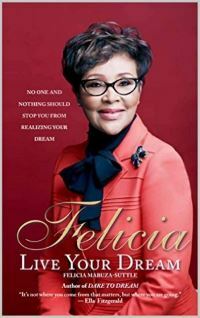 INTERVIEW: Felicia Mabuza-Suttle on her book "Felicia, Live Your Dreams"
She was named as one of the 100 Great South Africans in a survey done by SABC, South Africa's queen of talk, Felicia Mabuza-Suttle is living her dreams. From growing up in Soweto, she realised her potentials and became on of South Africa's pioneers in the fields of communications, business, inspirational speaking and philantrophy, amongst others. 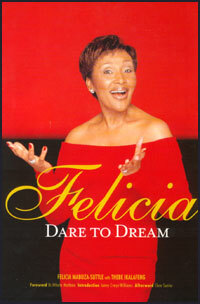 Felicia Mabuza-Suttle has released her latest book, titled "Felicia, Live Your Dreams". She joins us in the studio.